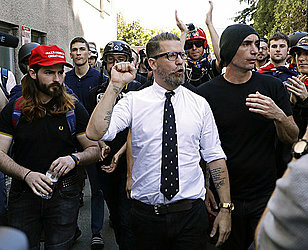 NEW YORK (AP) — The far-right Proud Boys and their founder, Gavin McInnes, have been banned from Facebook and Instagram because of policies against hate groups. McInnes called the ban censorship in an email Wednesday. He said "the left" is "ramping up the hysteria with fake news" ahead of next week's elections. The Southern Poverty Law Center uses the hate group label for the all-male Proud Boys. But the group identifies as "western chauvinists" and say they "refuse to apologize for creating the modern world."